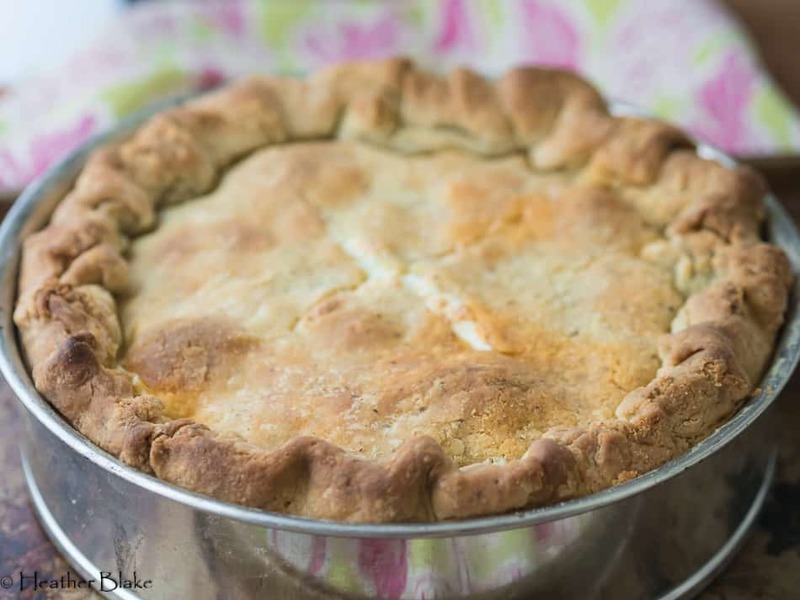 Italian Easter Pie is something fun and different to serve on your Easter table! Italian’s do it! So should you! So while I was thinking of what to make for Easter this year, I decided to do a little research and see what people in other countries make for the holiday dinner. Well, I hate to say this but here in the good Ol’ USA, we are boring. A baked Ham is so yesterday especially when you can make what the Italians eat. Easter Pie! Easter Pie, aka, Pizza Rustica, Pizza Giana, Torta Pasqualina, Pizzachino or Pizza Piena (depending on what region of Italy that you are in), is a very typical dish that you see on many tables in Italy during Easter along with lamb and various types of salads. My guess is that since it’s the end of Lent and all the Italians are craving mounds of meat and cheese that they came up with the most meat filled concoction that they could come up with! Italians are so smart… Masters of food. 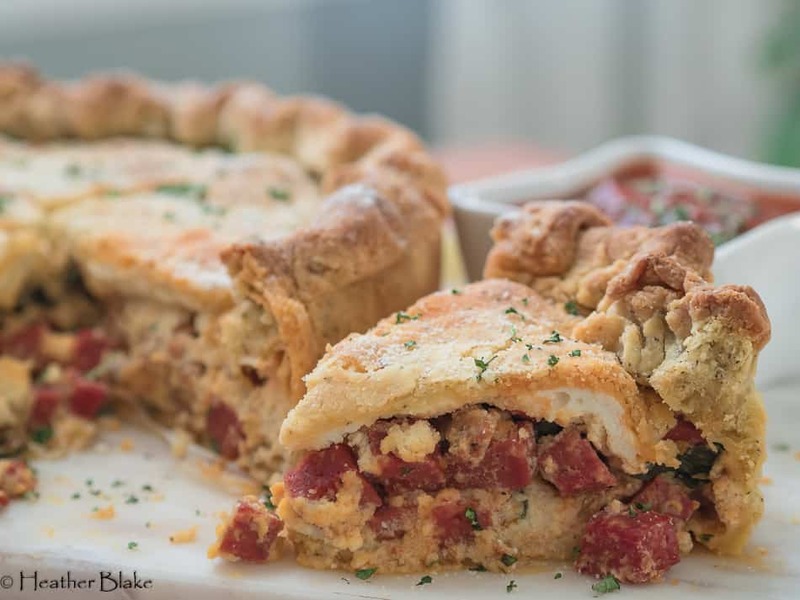 Typically, Easter Pie has basically every sort of Italian deli meat in it. I couldn’t go down that road as it’s a huge calorie bomb already so I just chose to use sweet Italian sausage and a really good pepperoni that I got at the deli counter. I also added a bunch of spinach, garlic and, onions to make super savory and at least give the appearance of eating something sorta healthy. Haha. I love how this turned out and can’t wait to bring it the Brunch that I’m going to on Easter. It’s super impressive looking as you can see! Give this a try. You can also load it up with tons of vegetables if you like, but why would you do that? It’s meat pie!!! 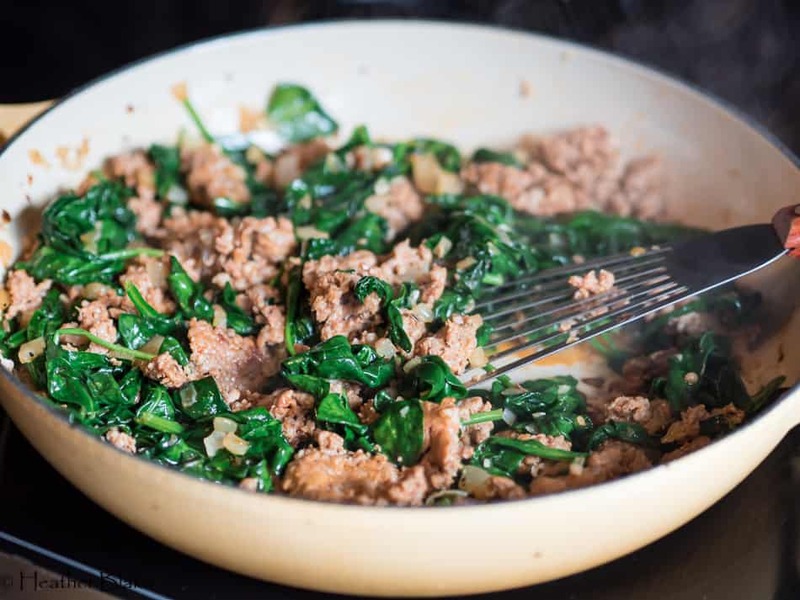 You will want to precook the sausage with the onions, garlic, and spinach. Let it cool before adding to the pie! The pastry dough for this recipe is super savory! It even has pepper in it! It’s a perfect accompaniment for the super-rich and hearty filling! When preparing the dough, make one piece a little larger for the bottom of the springform pan plate! You will need a springform pan for this recipe. The high sides make it look more impressive for sure. If you don’t have a springform pan, a deep dish pie plate will work just fine. You will just have trim off more pastry dough though as this recipe makes enough for the bigger pan! No biggy, totally worth it! Check out all the fresh motz! Just perfect to make this pie even better! The final prep of the pie! Fresh mozzarella cheese! It gets all melty and good!! This pie weighs like 3 pounds or more when it’s done! Kinda crazy if you ask me! The hot pie straight out of the oven! You will need to let it cool for an hour or before cutting it! Tastes great at room temperature! If you would like, serve your favorite marinara sauce on the side for a little dipity dip! Lol! This Italian Easter Pie sure is pretty! Wow, your guests with this! Do as the Italians do for Easter and make this beautiful Italian Easter Pie! It's filled with a plethora of meat and cheese. 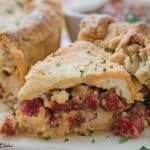 This is a hearty and savory pie! Blend the flour, butter, salt, pepper and, Italian seasoning in a food processor until the mixture resembles coarse meal. Add the eggs. With the machine running, add the water 1 tablespoon at a time until the dough forms. Gather the dough into a ball. Divide the dough into 2 pieces. Make 1 piece twice as large as the second piece. Flatten the dough pieces into disks. 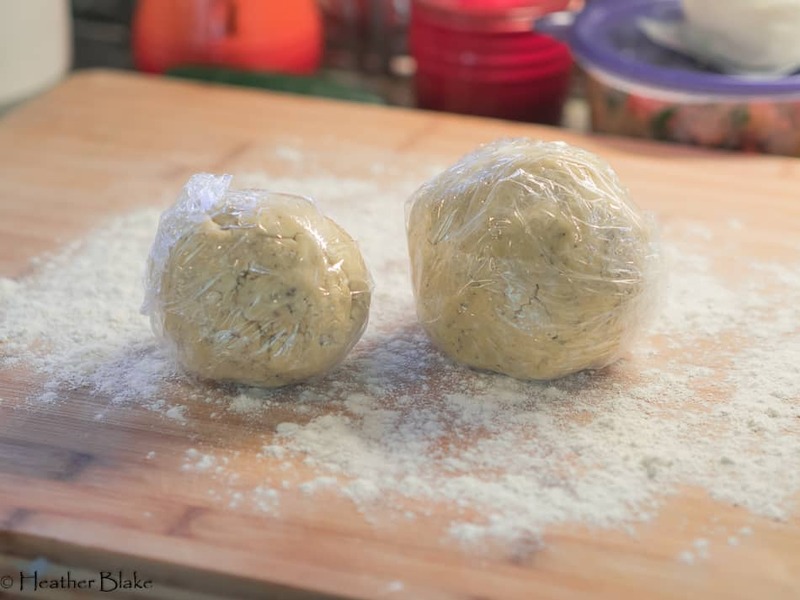 Wrap in plastic wrap and refrigerate for at 30 minutes until the dough is firm enough to roll out. This can be made the night before and refrigerated until you are ready to make the pie. In a large 12 inch skillet over medium heat, add the sausage, onions, garlic, salt, pepper and, chili flake. Cook until the sausage is cooked through. Add the spinach and continue to cook until the spinach is wilted. Remove from heat and add the pepperoni. Set aside until you are ready to assemble the pie. In a large bowl stir together the ricotta cheese, eggs, parmesan cheese, salt, pepper and, nutmeg until well combined. Set aside. 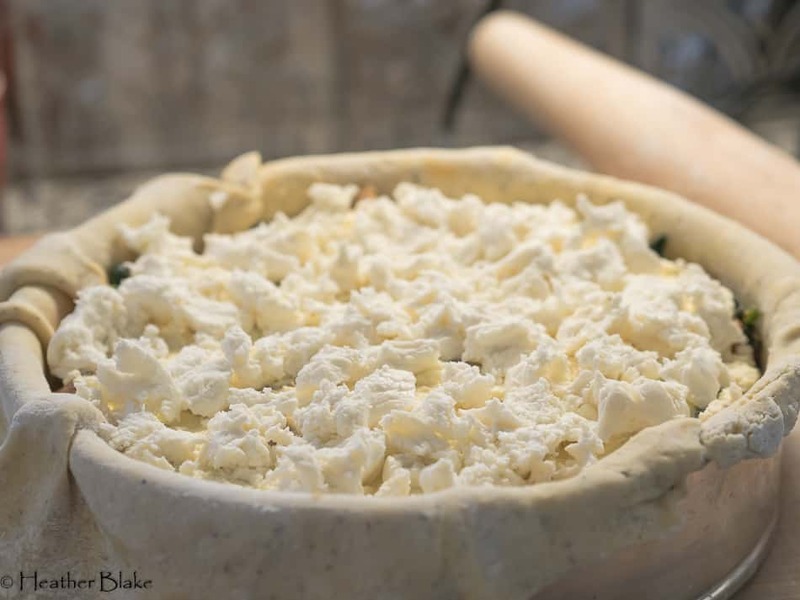 When ready to make the pie, Roll out the larger piece of dough on a lightly floured work surface to a 17-inch round. Transfer the dough to a 9-inch springform pan which you will need to spray liberally with cooking spray. Spoon a layer of the meat mixture then a layer of the ricotta mixture into the dough-lined pan. Alternate layers until all the fillings are in the pie. Top the meat/ricotta mixture with torn pieces of mozzarella cheese. Roll out the remaining piece of dough into a 12-inch round. Place the dough over the filling. Crimp the edges of the dough together to seal. Brush the pie with about 2 tablespoons of olive oil. Bake in a 400-degree oven until the crust is golden brown, about 1 hour. Let the pie sit for an hour or so before releasing the springform pan. Transfer to a platter and serve. Thank you! It’s a great recipe! Looks pretty mouth-watering. 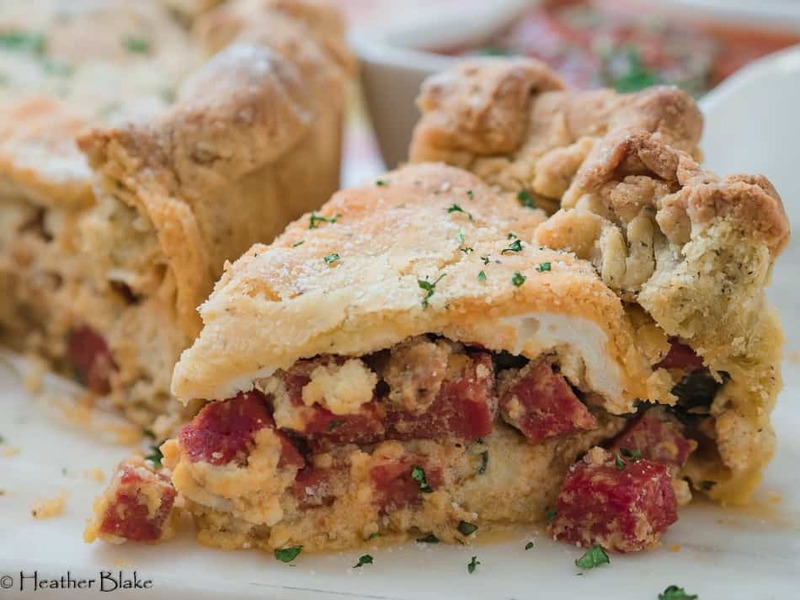 It’s hard not to love sausage, pepperoni, ricotta, parmesan and mozzarella wrapped in pastry. Right? I could you mess up combining all these great things!